A total of 19,168 black Marines served in World War II, all of those in units trained at the sub-camp of Camp Lejeune. Navy Secretary Francis Matthews on June 23, 1949 ordered the end of racial division within the Navy and Marines. An era ended at Montford Point. Veterans of the installation in 1965 formed the Montford Point Marine Association that today has twenty-three chapters. One veteran has described his Marine experience as one of “pride mixed with bitterness.” Two years after the death of Sergeant Johnson (at a testimonial dinner of the MPMA in Jacksonville), the Marine Corps renamed the installation Camp Johnson in his honor. Department of Defense, Department of the Navy, U.S. Marine Corps. "Marines receiving instruction in the Demolition Course at Montford Point Camp [NC], during intensive combat training in preparation for action in the Pacific." 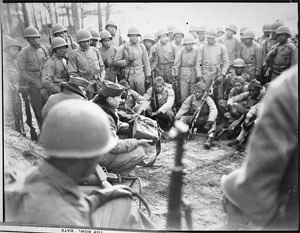 February 1945. http://commons.wikimedia.org/wiki/File:%22Marines_receiving_instruction_in_the_Demolition_Course_at_Montford_Point_Camp_(NC),_during_intensive_combat_training_in_-_NARA_-_532516.jpg (accessed March 19, 2015).